In the world of electronic health record software, things are changing rapidly. The healthcare industry is trending towards replacing outdated or obsolete EHR systems, or EHR systems that are seen as ineffective or troublesome by users. A look at the medical industry today shows that practice leaders are updating and replacing EHR systems at a pretty significant rate — some studies last year showed almost a 60% increase in the number of providers looking for new EHR systems. If it’s not exactly a stampede, it’s a significant trend that shows how important it is for medical practices to have the right support software backing their daily operations. One obvious reason that so many doctors are considering updating their EHR systems is simply obsolescence. Cloud computing and other major advances have led to quick progress in enhancing this type of practice management software, and there are a lot more features and functionality that are commonplace now than there were in EHR systems just a few years ago. Another major reason for replacement is that doctors and clinical workers may not see the interface of their existing EHR system as intuitive or easy to use. A 2015 report from HealthcareITNews cites “cumbersome” and “faulty” EHR interfaces driving 24% of the movement to change EHR providers. In some cases, it’s simply too hard to enter data or select results. In other cases, the programs experience significant downtime, or even crash. It doesn’t take much for a busy medical professional to develop a very bad opinion of the support software they use, if it’s not available in real time. A doctor’s schedule is so rushed during the course of the day that they don’t have time to wait for screen updates, or re-do instructions on faulty or unresponsive systems. Yet another reason for replacement is the failure of some EHR products in being “interoperable” or compatible with other parts of an IT architecture. The overall design of the software is ultimately important, and it’s a good indicator of whether or not physician offices will stay with these products as happy customers, or move on to a different vendor. However, medical practices have to be careful when making a move with EHR. That’s because these support resources are so fundamental in day-to-day clinical work that they can have a big impact on how an office functions. The right EHR choice can provide streamlined, efficient services and help doctors feel confident that they can get through everything that they need to do during a day. Inferior or mismatched products can eat up valuable time, confuse doctors and other users, and really create problems for a practice. This long term really just refers to figuring out how ‘legacy’ data, or data sets existing in current tools, will be used in the new system. Understanding this equation is crucial to making sure that doctors and others get the most out of what’s assimilated into the new EHR system. Getting internal buy-in for new EHR systems can be tough enough, but there’s another hurdle healthcare providers need to go through when they’re looking to update their practice management systems by going with an alternative EHR vendor. Medical offices have to have a frank discussion with their existing vendor to understand how the process works. By skipping this step, practice leaders can be setting themselves up for unpleasant surprises. In recent medical press, some EHR vendors have gotten black marks on their records for seeming to ‘hold data hostage’ — to attach some demands to the continued provision of the services that help medical offices serve their patients on a day-to-day basis. If all of the office’s health records, scheduling, billing information and other data sets are resident in a piece of vendor software, that vendor has a certain amount of power in their hands. Of course, the vendor can’t legally make off with that data, due to existing rules and regulations, but they can make things tough for the medical office if they’re not on board with their client making a switch. Talk and make sure that everything is worked out before going ahead with the system to replace EHR software. It’s also just as important that there’s a consensus inside the business, and that everybody knows what’s going on. When people have more of an idea of how a new EHR system will work, they’re more likely to embrace it, and opt to go ahead and update. The medical office also has to recognize the challenges of starting all over with a new system — it’s going to take work. It helps to get preliminary training manuals or introductions to the new systems before they actually are put in place, so that people at all levels of staff can start to get familiar with the interface and how it’s built. It’s also critically important for practice leadership to develop a sufficient training schedule with the vendor, and tell people about it as soon as possible. With so many EHR systems on the market today, it can be difficult just to understand the features and functionality that each one offers in the context of the market. That’s where a selection platform comes in. 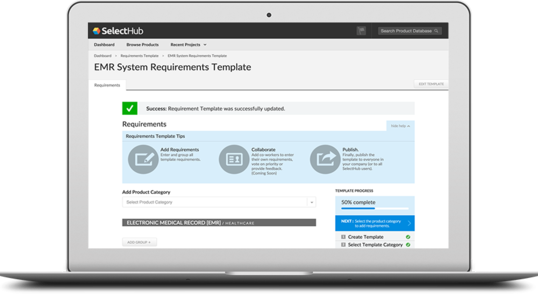 A selection platform helps you organize the steps you need to take to implement a new EHR system. In addition, practice leaders can take a look at an array of products on a single website to start to compare and contrast their choices. Using a selection platform can make the job of EHR replacement a whole lot easier. See the Price/User for the top EHR Software... plus the most important considerations and questions to ask. Actionable insights for all leading solutions. including comparison ratings, reviews and pricing from actual selection projects - FREE. Click here to get the report.